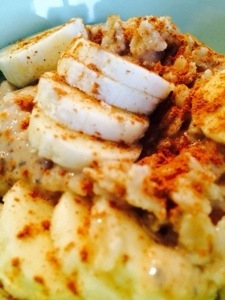 I have recently posted several oatmeal recipes. My preconceived notion about oatmeal was that I simply didn’t like it. I’m from South Carolina. I don’t eat oatmeal. But then, I made oatmeal that tasted like a bowl of peanut butter and oatmeal that tasted like pumpkin pie. Quickly, I realized that with a $2.50 container of oats from Target and a little imagination, I could make breakfast that tasted like dessert AND filled me up. The only drawback to my oatmeal recipes is that they take a little time to make. While I set my alarm with ample time provided for breakfast, I still don’t have enough time to make, eat and clean that pesky pot of oatmeal. Lately, I’ve read several blogs with recipes for overnight oatmeal. Basically, these recipes include time in the refrigerator for the oats to absorb the flavors. Duh. I can do that. This is brownie batter oatmeal that I cooked at night in a big batch and reheated in the morning in approximately 1 minute and 30 seconds and topped with a cute little banana. Adapt any of my oatmeal recipes to create a big batch by following the directions on the oats package and doubling or tripling the tasty ingredients. You can’t mess it up. You might, however, have a huge problem standing in front of the refrigerator spooning out of the container you put it in. Bring the water or milk to a boil. Reduce the heat to low and add the oats. Cook for five minutes. Add a about a 1 cup of the cooked oats to a blender or magic bullet with the peanut butter, vanilla, protein, banana, and stevia. Combine until smooth. Stir the blended mixture back into the pot with the cooked oats. Stir it all together. Put the cooked mixture into a container to store in the refrigerator. I separated mine into single servings to make it even easier in the mornings. When you are ready to eat, microwave about 1 minute and 30 seconds or until hot. Top with half of a sliced banana.